For anyone eager to understand their child's gender experience, or to learn how best to accept, support and protect them, this book will provide knowledge, reassurance and the confidence to do so. When Anna Bianchi's grandchild asked, "Nanny, you do know I'm a girl, don't you? ", Anna recognised this as a pivotal, and daunting, moment in their relationship. She knew that to answer her grandchild, who had been assigned male at birth, her own attitudes, assumptions and beliefs about gender would need to be examined. With reassuring honesty and openness, Anna draws deeply on four areas: her own experience, current research, interviews with children and their families, and a discussion of power, both in society and between children and adults. She shows how the inner journey of the adult inevitably impacts on the outer journey of the child and, given the significance of this, offers a step-by-step guide to becoming an ally to the gender-expansive child. 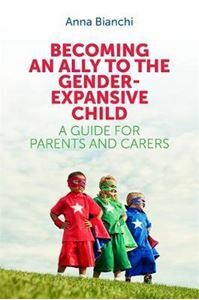 For anyone eager to understand their child's gender experience, or to learn how best to accept, support and protect them, this book will provide knowledge, reassurance and the confidence to do so.